The Department of English and Creative Writing welcomes Elizabeth Rottenberg, Professor and Associate Chair, Comparative Literature, DePaul University, to its lecture series. Professor Rottenberg was educated at The Humanities Center at Johns Hopkins University, the École Normale Supérieure in Paris, and the Albert-Ludwigs-Universität in Freiburg. 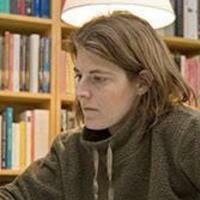 She teaches courses in the areas of contemporary French philosophy and psychoanalytic theory. Her most recent book is For the Love of Psychoanalysis: The Play of Chance in Freud and Derrida (Fordham).​ She is also the author of Inheriting the Future: Legacies of Kant, Freud, and Flaubert (Stanford). This lecture is free and open to the public. It will take place in the Wren Room (Sanborn 104), Sanborn House, Dartmouth College, 19 N. Main Street, Hanover, NH.